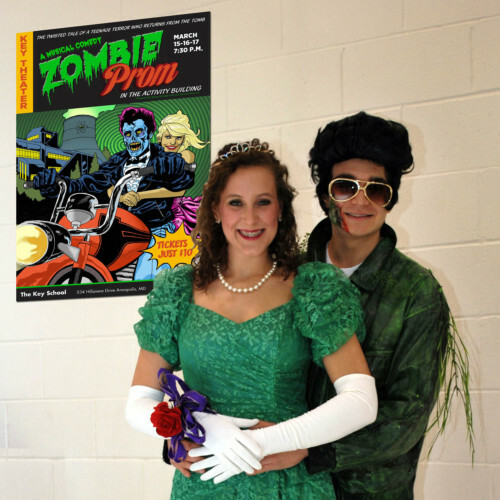 Students in grades 9 through 12 at The Key School will perform ‘Zombie Prom’ on March 15, 16 and 17. Performances begin at 7:30 p.m. in the Key School Activity Building. This year’s annual musical, which includes nearly 40 Key students, is part love story, part musical, part zombie flick, and part comedy. Written by John Dempsey as an off-Broadway spoof of the horror films of yesteryear, this cult classic hit takes place in an Eisenhower-era American town: Lucy and Ed Sullivan are TV hits, bouffant hairdos grace magazine covers, and the cast of characters are straight out of Archie Comics. The production allows the cast to be relentlessly campy and to honor an aesthetic style that is ostentatious, exaggerated, affected, and theatrical. The style of the score embraces the late 1950s popular music of Frankie Avalon, Chuck Berry and Ricky Nelson, with choreography by Key School students. The show is open to the public and appropriate for ages 8 and up. Tickets are $10 and available at the door.